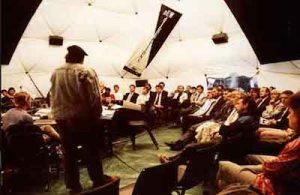 In the late 1980's, The polymedia performance group Floating Exceptions (David Worrall, Stuart Ramsden, Virginia Read, Andrew Bernard, Susan Reid, Andrew Smith and Kimmo Vennonen) created The Bicentennial Dome the portable performance space shown below. 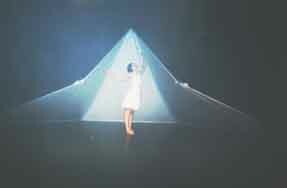 Floating Exceptions toured with it to stage their polymodal works in sound and image, as performances and installations. 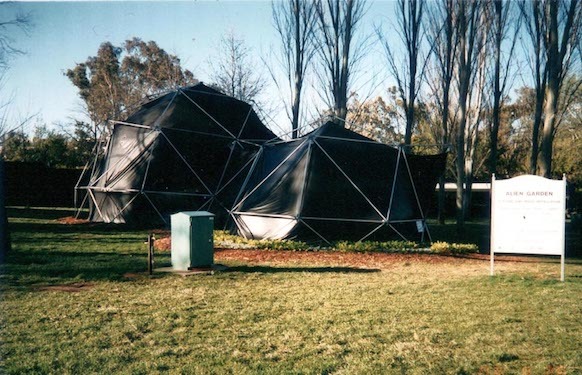 Following this space Worrall produced a much more minimal portable space and, with Stephen Duke, Dean Golja and Josh Chaffey, produced The Floriade Domes which were first used for the large scale polymedia work Alien Garden for the Floriade festival in 2003. 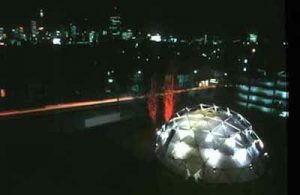 The Floating Exceptions portable performance space, photographed at night from the top of the Seymour Centre, Sydney. 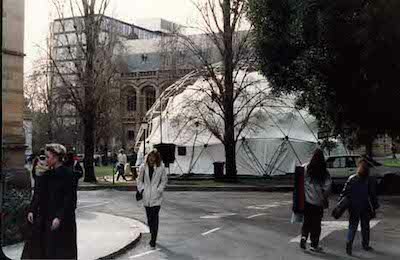 A Geodesic Hemisphere in Galvanised Steel and Kevlar. Designed and constructed in 1988 as a portable touring concert space, this heavy-duty dome toured to many Australian cities. It was designed specifically to enable heavy objects such as loudspeakers, acrobatic swings, projection screens etc to be suspended from the inside. It takes about 10 people 1 day to erect, less to dismantle. Frame 4 frequency icosahedral hemisphere, class I method II.Radius:7 metres (22 feet). Canopy Single piece heat-welded scalloped Polymar 6505 suspended from the frame by means of a custom double spring suspension system. Erection Block and tackle. 10 people x 1 day. Can be transported in a 1.5 x 2 metre (6 x 8 feet) trailer. Weight 1.4 tonne (including canopy). Technology 16-channel sound system, 5 projector screen display. Capacity Seats 150-200 people, depending on configuration. For full details of concept and installation. Designed as a minimal lightweight structure. 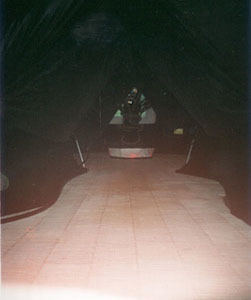 Looking down the Alien Garden tunnel from smaller to the larger dome. Frames 3 frequency octahedral hemisphere, class I method II. Radius: 4.6 metres. Aluminium and plastic. Sits on a 800mm base. Joined by a mutually supporting tunnel to a 2.9 meter radius 2 frequency octahedral hemisphere. Both domes are mounted on triangulated bases. 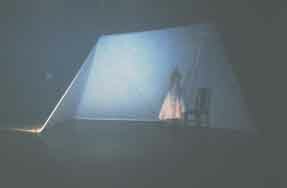 Canopy 2 mm double-weave plastic coated sailcloth. Erection By hand. 4 people x 1 day. Can be transported on standard car: frame on roof rack, canopy in luggage compartment. 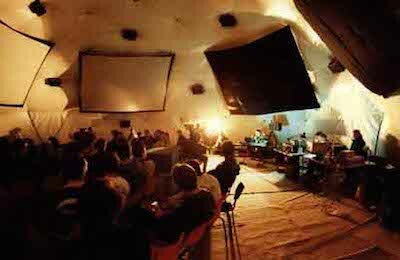 Technology Standard is 20-channel sound system, 4 projector screen display. Multiple variations possible. Capacity Seats ~100 people, depending on configuration. 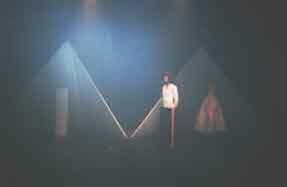 Examples shown here are of a 10 metre X 3.5 metre parallelogram in five jointed sections. 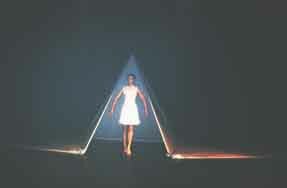 Commissioned by the Australian Choreographic Centre for their 2002 production of production of Ada. In geometry, a geodesic is the shortest arc joining two points on a curved surface. Place is modal, whereas space is scalar. Places are enclosing, concave, coherent; they are exhibit entity, existence, exude ontological affirmation: aural places, visual places, tactile places, public and private places, mental places, polyperceptual places. 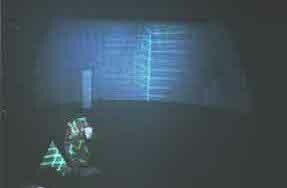 Internal places, environments, sound-fields, mind-fields, mine-fields! See Plans for Polymedia Event Theatre 3.